If you have been exposed to the Flash Player Premium SMS scam, you are at risk of wasting money and downloading a questionable piece of software onto your operating system. According to our research, the source of the scam is http://www.updateflash.club/, and according to the information on this website, you need to acquire Adobe Flash Player, which is represented as an “essential complement to your computer.” A Download button is shown on this site, and a disclaimer below it informs that you will need to pay €5.79 for a code, which is an indication that you are dealing with a scam. The strangest thing is that you do not need to pay any money to acquire the potentially unwanted program that is presented via the scam. We talk more about this in this report. If you have downloaded the program, we suggest deleting it as soon as possible. Even if you have not downloaded anything after being exposed to the misleading alert, you need to inspect your operating system to check if you need to remove Flash Player Premium SMS scam-related malware. When you click the Download link on the updateflash.club website, you are introduced to a pop-up that allegedly represents the installer of AdobeFlashPlayer. If you follow the steps of the installer, you end up on a page that asks to send a message to a specific number to obtain a special code. You should not focus on this code because you do not need it. If you click the “Cancel” button on this page, UpdateChecker.exe by QUICK IDEAS, S.L. is downloaded automatically. 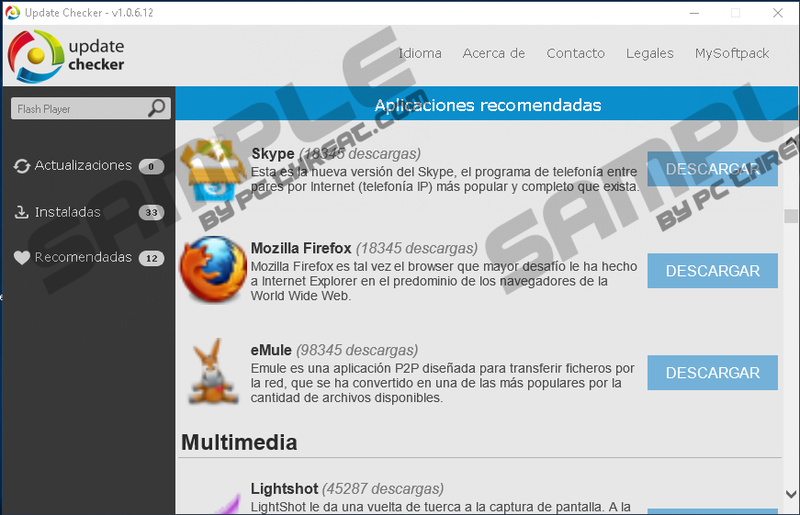 The publisher of this file is Mysoftpack, and it installs an application called “Update Checker.” The interface of this application is in Spanish, and it is meant to list all available updates for the programs installed onto your computer. Our research team classifies this app as a potentially unwanted program (PUP) because, clearly, it tries to conceal itself as the authentic, well-known Adobe Flash Player. On top of that, it swindles gullible victims out of their money. Have you sent the expensive Flash Player Premium SMS but the code was not sent back? That is likely to happen because, after all, it is a scam. Although the pop-up representing Flash Player Premium SMS can be introduced to users via the website we have discussed already, our research team warns that it could also be shown via an adware server. One example of that is onclickrev.com. If you are being redirected to random pages and shown random ads or pop-ups, it is possible that malware exists on your operating system, and it is extremely important that you employ a trustworthy malware scanner to perform a thorough inspection. Hopefully, nothing is found, and all you need to do is attend to the browser via which the misleading Flash Player Premium SMS pop-up was shown. However, if malicious threats are found, you need to delete them as soon as possible. If you decide that you will erase all threats manually, make sure you analyze (look up removal guides that are available on this site) and eliminate every threat individually. Alternatively, you could also download an anti-malware program to find and automatically erase all malicious infections and their components. If you have downloaded Update Checker, we recommend deleting it from your Windows operating system as soon as possible. The guide below shows how to uninstall it from your computer. But even if you have not downloaded anything, and a reliable scanner has determined that you do not need to delete Flash Player Premium SMS-related malware, you still need to do a couple of things. First of all, reset the browser via which the pop-up was shown. Next, clear the browsing data. If tracking cookies were placed to spy on you, they will be removed in the process. In the future, if you do not want to face scams, you need to practice safe browsing. Do not download unfamiliar software or randomly offered files of seemingly familiar programs (e.g., Adobe Flash Player). Also, do not click on links or advertisements and pop-ups that could expose you to unreliable content. Do not forget to protect your system using a legitimate anti-malware program too. If you have questions, post them in the comments section. Open the browser, tap Alt+T, and click Internet options. Click the Advanced tab, click Reset, mark Delete personal settings, and click Reset again. Tap keys Ctrl+Shift+Delete to access the Delete Browsing History menu. Choose the right boxes and then click Delete. Open the browser, tap Alt+F, and click Settings. Click Advanced at the bottom, scroll down, and click the Reset button. Tap keys Ctrl+Shift+Delete to access the Clear browsing data menu. Choose the right time range and boxes and then click Delete. Open the browser, tap Alt+H, and click Troubleshooting information. Click the Refresh Firefox button to reset the browser. Tap keys Ctrl+Shift+Delete to access the Clear All History menu. Choose the right time range and boxes and then click Clear Now. Click Start/Windows logo on the Taskbar. Open Control Panel (enter control panel into the search field on Windows 10). Move to Uninstall a program/Add or Remove Programs. Quick & tested solution for Flash Player Premium SMS removal.